India’s next big fighter purchase, an estimated 200-250 jets to be made-in-India in association with a foreign partner may include twin-engine aircraft opening up the field to Dassault Rafale, Boeing’s F/A-18 and possibly the MiG-35. Indications to this effect were available during a press conference by India’s outgoing Indian Air Force (IAF) chief, Arup Raha who said yesterday that India may require 200-250 aircraft of the Dassault Rafale type of which 36 have been ordered. The Indian government wants to make the aircraft in India to fulfil the needs of the IAF and export it to foreign markets. It was earlier reported that the Indian MoD had sought information from foreign manufacturers about their single-engine fighter jets. Consequently, Lockheed Martin and Saab, manufacturers of single engine F-16 and Gripen fighters respectively made their pitches to the MoD. However, if the Indian MoD has expanded the scope of the offer to include twin-engine fighter jets, then it opens up the field considerably and many involve long-drawn testing, evaluation and contract negotiations. Perhaps bolstering the contention that twin-engine fighter manufacturers are also in the fray, Michael Koch Boeing’s President for Defence, Space and Security in India, used an Indian publication, Businesline to hardsell the F/A-18, also called the Super Hornet. “The Super Hornets will be built in India in a world class advanced manufacturing facility with the very latest technologies in place. Koch was quoted as saying that the Super Hornet not only has a low acquisition cost, but it costs less per flight hour to operate than any other tactical aircraft in US forces inventory (read F-16). That includes single engine fighters, which many would incorrectly assume are cheaper to operate. 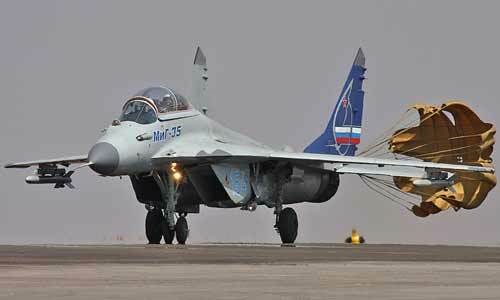 In addition, a Russian source told defenseworld.net that his country has received a letter seeking information about a fighter plane and they may pitch in with the MiG-35 if invited to bid by India. India was to manufacture the fighter jet by a team involving an India ‘strategic partner’ and the foreign manufacturer. Guidelines for what or who constitutes a strategic partner are yet to be released by the Indian MoD.